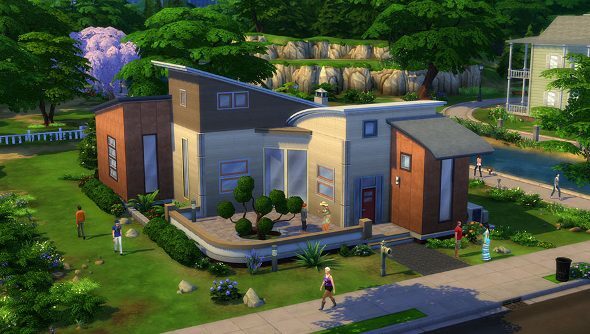 If you’re thinking of picking up Maxis’ twisted dollhouse, The Sims 4, when it launches in September, you might be able to claim some free digital junk just for owning a copy of The Sims 3 and its expansions. There are 13 rewards waiting to be claimed: one for owning The Sims 3, one for each expansion, and another for owning all of them like a giant Sims junkie. So the good news is that you could end up with a lot of free stuff. The bad news? It’s lamps. That’s what you get: a great big pile of lamps. Each of the lamps mimic the symbol that floats above Sims’ heads like a horrible, mind-controlling curse. But they come in different colours. If you own The Sims 3, you get a green one, own the Late Night expansion and you’ll get a red one that makes your Sim’s home look like a brothel. For owning all of the DLC, you do actually get something that isn’t a lamp. It’s a ridiculous gold llama trophy and it, admittedly, looks rather wonderful. So if you’re anticipating a great need for more lights in The Sims 4, you should probably grab all of the old expansions. It won’t bring your swimming pool back though.